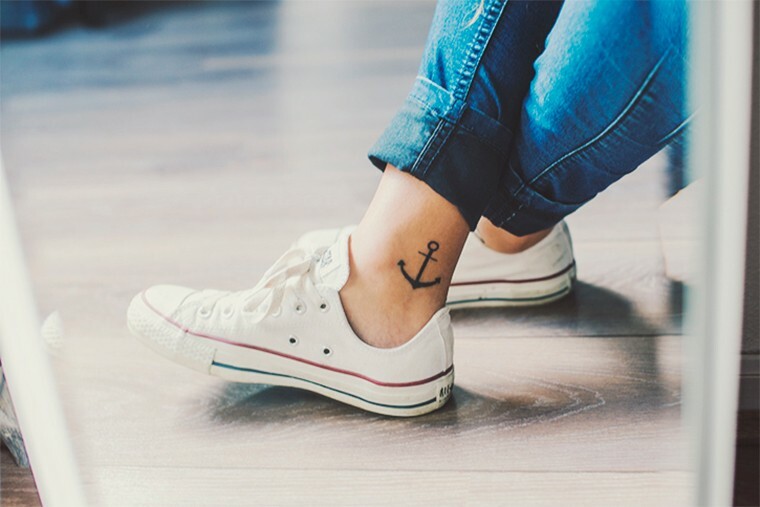 Anchor tattoos are fascinating not only because they look awesome but also because they hold a deep meaning. Anchor tattoo meaning has modified over the years. The earliest of the anchor tattoos were seen mostly on the arms of sailors. The tattoo was a source of motivation as they battled the seawaters. Many times, because of storms, the sailors used to be separated, and on meeting, they could easily recognize the other by their anchor tattoos. The look of the tattoo was basic with no elements of decoration. Sometimes, the name of the sailor was also tattooed alongside the anchor. As tattoo art began to find appreciation amongst the public, a host of tattoo symbols became popular out of which anchor tattoos were most sought after. The tattoo was preferred by people, who wished to fight off the feeling of being stranded or ignored. With an anchor tattoo, they experienced a sense of security. Thus, this tattoo was typically found on the arms of students, who had just left their homes and budding entrepreneurs, who wanted to make a name in their respective fields. As the years passed by, the anchor tattoo designs began to change, and some of them became quite complex. Now, the tattoos have evolved to be categorized as feminine and masculine. The feminine designs include the use of flowers, birds, insects, and butterflies whereas the masculine ones have rope, skull, ship, globe, etc. Despite the categorization, both men and women can be seen sporting masculine and feminine anchor tattoo designs. Hence, if you happen to like a design, you should not mull over its design being feminine or masculine. Gothic art is different and quirky. Gothic anchor tattoo meaning would be facing the fears that often have a gloomy effect on you. Hence, these tattoo styles would portray elements like high sea waves, lizards, crocodile, skulls, cross, grave, etc. Anything of which you are afraid could be included in the design. Normally, the tattoos are inked in dark colors like black, navy blue, dark gray, etc. It is how the tattoo has the air of gloominess. Most common elements are items related directly to the anchor such as compass, seaman’s logbook, waves, ship, lifeboat, rope, etc. These items, even when they are small anchor tattoos, look elegant with the design and show that the design has a theme. Items indirectly related to the anchor could be anything. You could have stars, sea birds, pearls, tortoises, and anything else that you think fits the bill. The objective of combining the anchor tattoo with other items is to make the design look richer and make others curious. Seeing an unusual tattoo, people will be drawn to you and start a conversation. Names look beautiful with anchor tattoos. People choose names of their family members/partners and children. The name could be written in a font of your choice. Ask your tattoo artist to show you the available fonts. A more complex tattoo includes the face of your loved one. Many tattoo artists can reproduce a face in ink by looking at the person’s photograph. Overall, the association of name/face with an anchor tattoo would show how valuable the person is and how they make you feel secure. In reality, anchors are made of heavy metal and they are mostly rusted. That is why most anchors are in the shades of brown, gold, and black. If you choose to go for any other color, it may make your tattoo look psychedelic. If you are ready for it, go ahead.